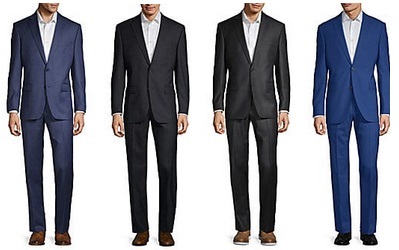 Home > Mens > Get 2 Men’s Wool Suits Only $349.99 + Free Shipping From Saks Off 5th (Saks Fifth Avenue, Calvin Klein, Lauren Ralph Lauren + More)! Get 2 Men’s Wool Suits Only $349.99 + Free Shipping From Saks Off 5th (Saks Fifth Avenue, Calvin Klein, Lauren Ralph Lauren + More)! November 29, 2018 Comments Off on Get 2 Men’s Wool Suits Only $349.99 + Free Shipping From Saks Off 5th (Saks Fifth Avenue, Calvin Klein, Lauren Ralph Lauren + More)! Saks Off 5th is offering men’s suits (Saks Fifth Avenue, Calvin Klein, English Laundry, and Lauren Ralph Lauren) for $399.99 – $499.99, but when you purchase 2 suits and add coupon code: 2SUITS to your cart to bring the price to only $349.99 for both suits (that’s just $174.99 per suit)! Kipling Seoul Go Large Backpack (Deep Purple) Only $47.88 From Macy’s!